The hypothesis of mantle plumes from depth is not universally accepted as explaining all such volcanism. It has required progressive hypothesis-elaboration leading to variant propositions such as mini-plumes and pulsing plumes. Another hypothesis for unusual volcanic regions is the "Plate model". This proposes shallower, passive leakage of magma from the mantle onto the Earth's surface where extension of the lithosphere permits it, attributing most volcanism to plate tectonic processes, with volcanoes far from plate boundaries resulting from intraplate extension. The theory was first proposed by J. Tuzo Wilson in 1963 and further developed by W. Jason Morgan in 1971. A mantle plume is posited to exist where hot rock nucleates at the core-mantle boundary and rises through the Earth's mantle becoming a diapir in the Earth's crust. In particular, the concept that mantle plumes are fixed relative to one another, and anchored at the core-mantle boundary, would provide a natural explanation for the time-progressive chains of older volcanoes seen extending out from some such hot spots, such as the Hawaiian–Emperor seamount chain. the mantle plume, driven by heat exchange across the core-mantle boundary carrying heat upward in a narrow, rising column, and postulated to be independent of plate motions. The plume hypothesis was studied using laboratory experiments conducted in small fluid-filled tanks in the early 1970s. Thermal or compositional fluid-dynamical plumes produced in that way were presented as models for the much larger postulated mantle plumes. On the basis of these experiments, mantle plumes are now postulated to comprise two parts: a long thin conduit connecting the top of the plume to its base, and a bulbous head that expands in size as the plume rises. The entire structure is considered to resemble a mushroom. The bulbous head of thermal plumes forms because hot material moves upward through the conduit faster than the plume itself rises through its surroundings. In the late 1980s and early 1990s, experiments with thermal models showed that as the bulbous head expands it may entrain some of the adjacent mantle into the head. The sizes and occurrence of mushroom mantle plumes can be predicted easily by transient instability theory developed by Tan and Thorpe. The theory predicts mushroom shaped mantle plumes with heads of about 2000 km diameter that have a critical time[clarification needed] of about 830 Myr for a core mantle heat flux of 20 mW/m2, while the cycle time[clarification needed] is about 2 Gyr. The number of mantle plumes is predicted to be about 17. When a plume head encounters the base of the lithosphere, it is expected to flatten out against this barrier and to undergo widespread decompression melting to form large volumes of basalt magma. It may then erupt onto the surface. Numerical modelling predicts that melting and eruption will take place over several million years. These eruptions have been linked to flood basalts, although many of those erupt over much shorter time scales (less than 1 million years). Examples include the Deccan traps in India, the Siberian traps of Asia, the Karoo-Ferrar basalts/dolerites in South Africa and Antarctica, the Paraná and Etendeka traps in South America and Africa (formerly a single province separated by opening of the South Atlantic Ocean), and the Columbia River basalts of North America. Flood basalts in the oceans are known as oceanic plateaus, and include the Ontong Java plateau of the western Pacific Ocean and the Kerguelen Plateau of the Indian Ocean. The narrow vertical pipe, or conduit, postulated to connect the plume head to the core-mantle boundary, is viewed as providing a continuous supply of magma to a fixed location, often referred to as a "hotspot". As the overlying tectonic plate (lithosphere) moves over this hotspot, the eruption of magma from the fixed conduit onto the surface is expected to form a chain of volcanoes that parallels plate motion. The Hawaiian Islands chain in the Pacific Ocean is the type example. It has recently been discovered that the volcanic locus of this chain has not been fixed over time, and it thus joined the club of the many type examples that do not exhibit the key characteristic originally proposed. The eruption of continental flood basalts is often associated with continental rifting and breakup. This has led to the hypothesis that mantle plumes contribute to continental rifting and the formation of ocean basins. In the context of the alternative "Plate model", continental breakup is a process integral to plate tectonics, and massive volcanism occurs as a natural consequence when it onsets. 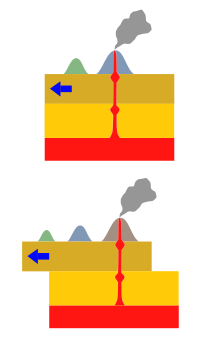 The current mantle plume theory is that material and energy from Earth's interior are exchanged with the surface crust in two distinct modes: the predominant, steady state plate tectonic regime driven by upper mantle convection, and a punctuated, intermittently dominant, mantle overturn regime driven by plume convection. This second regime, while often discontinuous, is periodically significant in mountain building and continental breakup. Hydrodynamic simulation of a single "finger" of the Rayleigh–Taylor instability, a possible mechanism for plume formation. In the third and fourth frame in the sequence, the plume forms a "mushroom cap". 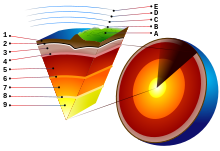 Note that the core is at the top of the diagram and the crust is at the bottom. The chemical and isotopic composition of basalts found at hotspots differs subtly from mid-ocean-ridge basalts. This geochemical signature arises from the mixing of near-surface materials such as subducted slabs and continental sediments, in the mantle source. There are two competing interpretations for this. In the context of mantle plumes, the near-surface material is postulated to have been transported down to the core-mantle boundary by subducting slabs, and to have been transported back up to the surface by plumes. In the context of the Plate hypothesis, subducted material is mostly re-circulated in the shallow mantle and tapped from there by volcanoes. The processing of oceanic crust, lithosphere, and sediment through a subduction zone decouples the water-soluble trace elements (e.g., K, Rb, Th) from the immobile trace elements (e.g., Ti, Nb, Ta), concentrating the immobile elements in the oceanic slab (the water-soluble elements are added to the crust in island arc volcanoes). Seismic tomography shows that subducted oceanic slabs sink as far as the bottom of the mantle transition zone at 650 km depth. Subduction to greater depths is less certain, but there is evidence that they may sink to mid-lower-mantle depths at about 1,500 km depth. The source of mantle plumes is postulated to be the core-mantle boundary at 3,000 km depth. Because there is little material transport across the core-mantle boundary, heat transfer must occur by conduction, with adiabatic gradients above and below this boundary. The core-mantle boundary is a strong thermal (temperature) discontinuity. The temperature of the core is approximately 1,000 degrees Celsius higher than that of the overlying mantle. Plumes are postulated to rise as the base of the mantle becomes hotter and more buoyant. Plumes are postulated to rise through the mantle and begin to partially melt on reaching shallow depths in the asthenosphere by decompression melting. This would create large volumes of magma. The plume hypothesis postulates that this melt rises to the surface and erupts to form "hot spots". Calculated Earth's temperature vs. depth. Dashed curve: Layered mantle convection; Solid curve: Whole mantle convection. The most prominent thermal contrast known to exist in the deep (1000 km) mantle is at the core-mantle boundary. Mantle plumes were originally postulated to rise from this layer because the "hot spots" that are assumed to be their surface expression were thought to be fixed relative to one another. This required that plumes were sourced from beneath the shallow asthenosphere that is thought to be flowing rapidly in response to motion of the overlying tectonic plates. There is no other known major thermal boundary layer in the deep Earth, and so the core-mantle boundary was the only candidate. The base of the mantle is known as the D″ layer, a seismological subdivision of the Earth. It appears to be compositionally distinct from the overlying mantle, and may contain partial melt. Two very large, broad, large low-shear-velocity provinces, exist in the lower mantle under Africa and under the central Pacific. It is postulated that small plumes rise from their surface or their edges. Their low seismic velocities were thought to suggest that they are relatively hot, although it has recently been shown that their low wave velocities are due to high density caused by chemical heterogeneity. Various lines of evidence have been cited in support of mantle plumes. There is some confusion regarding what constitutes support, as there has been a tendency to re-define the postulated characteristics of mantle plumes after observations have been made. Some common and basic lines of evidence cited in support of the theory are linear volcanic chains, noble gases, geophysical anomalies, and geochemistry. The age-progressive distribution of the Hawaiian-Emperor seamount chain has been explained as a result of a fixed, deep-mantle plume rising into the upper mantle, partly melting, and causing a volcanic chain to form as the plate moves overhead relative to the fixed plume source. Other "hot spots" with time-progressive volcanic chains behind them include Réunion, the Chagos-Laccadive Ridge, the Louisville Ridge, the Ninety East Ridge and Kerguelen, Tristan, and Yellowstone. An intrinsic aspect of the plume hypothesis is that the "hot spots" and their volcanic trails have been fixed relative to one another throughout geological time. Whereas there is evidence that the chains listed above are time-progressive, it has, however, been shown that they are not fixed relative to one another. The most remarkable example of this is the Emperor chain, the older part of the Hawaii system, which was formed by migration of volcanic activity across a geo-stationary plate. Many postulated "hot spots" are also lacking time-progressive volcanic trails, e.g., Iceland, the Galapagos, and the Azores. Mismatches between the predictions of the hypothesis and observations are commonly explained by auxiliary processes such as "mantle wind", "ridge capture", "ridge escape" and lateral flow of plume material. Helium-3 is a primordial isotope that formed in the Big Bang. Very little is produced, and little has been added to the Earth by other processes since then. Helium-4 includes a primordial component, but it is also produced by the natural radioactive decay of U and Th. Over time, He in the upper atmosphere is lost into space. Thus, the Earth has become progressively depleted in He, and 3He is not replaced as 4He is. As a result, the ratio 3He/4He in the Earth has decreased over time. Unusually high 3He/4He have been observed in some, but not all, "hot spots". In mantle plume theory, this is explained by plumes tapping a deep, primordial reservoir in the lower mantle, where the original, high 3He/4He ratios have been preserved throughout geologic time. In the context of the Plate hypothesis, the high ratios are explained by preservation of old material in the shallow mantle. Ancient, high 3He/4He ratios would be particularly easily preserved in materials lacking U or Th, so 4He was not added over time. Olivine and dunite, both found in subducted crust, are materials of this sort. Other elements, e.g. osmium, have been suggested to be tracers of material arising from near to the Earth's core, in basalts at oceanic islands. However, so far conclusive proof for this is lacking. Diagram showing a cross section though the Earth's lithosphere (in yellow) with magma rising from the mantle (in red). The crust may move relative to the plume, creating a track. The plume hypothesis has been tested by looking for the geophysical anomalies predicted to be associated with them. These include thermal, seismic, and elevation anomalies. Thermal anomalies are inherent in the term "hotspot". They can be measured in numerous different ways, including surface heat flow, petrology, and seismology. Thermal anomalies produce anomalies in the speeds of seismic waves, but unfortunately so do composition and partial melt. As a result, wave speeds cannot be used simply and directly to measure temperature, but more sophisticated approaches must be taken. Seismic anomalies are identified by mapping variations in wave speed as seismic waves travel through Earth. A hot mantle plume is predicted to have lower seismic wave speeds compared with similar material at a lower temperature. Mantle material containing a trace of partial melt (e.g., as a result of it having a lower melting point), or being richer in Fe, also has a lower seismic wave speed and those effects are stronger than temperature. Thus, although unusually low wave speeds have been taken to indicate anomalously hot mantle beneath "hot spots", this interpretation is ambiguous. The most commonly cited seismic wave-speed images that are used to look for variations in regions where plumes have been proposed come from seismic tomography. This method involves using a network of seismometers to construct three-dimensional images of the variation in seismic wave speed throughout the mantle. Seismic waves generated by large earthquakes enable structure below the Earth's surface to be determined along the ray path. Seismic waves that have traveled a thousand or more kilometers (also called teleseismic waves) can be used to image large regions of Earth's mantle. They also have limited resolution, however, and only structures at least several hundred kilometers in diameter can be detected. Seismic tomography images have been cited as evidence for a number of mantle plumes in Earth's mantle. There is, however, vigorous on-going discussion regarding whether the structures imaged are reliably resolved, and whether they correspond to columns of hot, rising rock. The mantle plume hypothesis predicts that domal topographic uplifts will develop when plume heads impinge on the base of the lithosphere. An uplift of this kind occurred when the north Atlantic Ocean opened about 54 million years ago. Some scientists have linked this to a mantle plume postulated to have caused the breakup of Eurasia and the opening of the north Atlantic, now suggested to underlie Iceland. Current research has shown that the time-history of the uplift is probably much shorter than predicted, however. It is thus not clear how strongly this observation supports the mantle plume hypothesis. 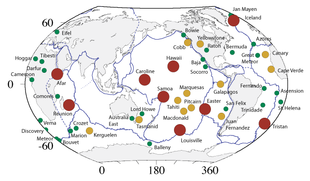 Basalts found at oceanic islands are geochemically distinct from those found at mid-ocean ridges and volcanoes associated with subduction zones (island arc basalts). "Ocean island basalt" is also similar to basalts found throughout the oceans on both small and large seamounts (thought to be formed by eruptions on the sea floor that did not rise above the surface of the ocean). They are also compositionally similar to some basalts found in the interiors of the continents (e.g., the Snake River Plain). In major elements, ocean island basalts are typically higher in iron (Fe) and titanium (Ti) than mid-ocean ridge basalts at similar magnesium (Mg) contents. In trace elements, they are typically more enriched in the light rare-earth elements than mid-ocean ridge basalts. Compared to island arc basalts, ocean island basalts are lower in alumina (Al2O3) and higher in immobile trace elements (e.g., Ti, Nb, Ta). These differences result from processes that occur during the subduction of oceanic crust and mantle lithosphere. Oceanic crust (and to a lesser extent, the underlying mantle) typically becomes hydrated to varying degrees on the seafloor, partly as the result of seafloor weathering, and partly in response to hydrothermal circulation near the mid-ocean-ridge crest where it was originally formed. As oceanic crust and underlying lithosphere subduct, water is released by dehydration reactions, along with water-soluble elements and trace elements. This enriched fluid rises to metasomatize the overlying mantle wedge and leads to the formation of island arc basalts. The subducting slab is depleted in these water-mobile elements (e.g., K, Rb, Th, Pb) and thus relatively enriched in elements that are not water-mobile (e.g., Ti, Nb, Ta) compared to both mid-ocean ridge and island arc basalts. Ocean island basalts are also relatively enriched in immobile elements relative to the water-mobile elements. This, and other observations, have been interpreted as indicating that the distinct geochemical signature of ocean island basalts results from inclusion of a component of subducted slab material. This must have been recycled in the mantle, then re-melted and incorporated in the lavas erupted. In the context of the plume hypothesis, subducted slabs are postulated to have been subducted down as far as the core-mantle boundary, and transported back up to the surface in rising plumes. In the plate hypothesis, the slabs are postulated to have been recycled at shallower depths – in the upper few hundred kilometers that make up the upper mantle. However, the plate hypothesis is inconsistent with both the geochemistry of shallow asthenosphere melts (i.e., Mid-ocean ridge basalts) and with the isotopic compositions of ocean island basalts. In 2015, based on data from 273 large earthquakes, researchers compiled a model based on full waveform tomography, requiring the equivalent of 3 million hours of supercomputer time. Due to computational limitations, high-frequency data still could not be used, and seismic data remained unavailable from much of the seafloor. Nonetheless, vertical plumes, 400 C hotter than the surrounding rock, were visualized under many hotspots, including the Pitcairn, Macdonald, Samoa, Tahiti, Marquesas, Galapagos, Cape Verde, and Canary hotspots. They extended nearly vertically from the core-mantle boundary (2900 km depth) to a possible layer of shearing and bending at 1000 km. They were detectable because they were 600–800 km wide, more than three times the width expected from contemporary models. Many of these plumes are in the large low-shear-velocity provinces under Africa and the Pacific, while some other hotspots such as Yellowstone were less clearly related to mantle features in the model. The unexpected size of the plumes leaves open the possibility that they may conduct the bulk of the Earth's 44 terawatts of internal heat flow from the core to the surface, and means that the lower mantle convects less than expected, if at all. It is possible that there is a compositional difference between plumes and the surrounding mantle that slows them down and broadens them. An example of plume locations suggested by one recent group. Figure from Foulger (2010). Many different localities have been suggested to be underlain by mantle plumes, and scientists cannot agree on a definitive list. Some scientists suggest that several tens of plumes exist, whereas others suggest that there are none. The theory was really inspired by the Hawaiian volcano system. Hawaii is a large volcanic edifice in the center of the Pacific Ocean, far from any plate boundaries. Its regular, time-progressive chain of islands and seamounts superficially fits the plume theory well. However, it is almost unique on Earth, as nothing as extreme exists anywhere else. The second strongest candidate for a plume location is often quoted to be Iceland, but according to opponents of the plume hypothesis its massive nature can be explained by plate tectonic forces along the mid-Atlantic spreading center. Mantle plumes have been suggested as the source for flood basalts. These extremely rapid, large scale eruptions of basaltic magmas have periodically formed continental flood basalt provinces on land and oceanic plateaus in the ocean basins, such as the Deccan Traps, the Siberian Traps the Karoo-Ferrar flood basalts of Gondwana, and the largest known continental flood basalt, the Central Atlantic magmatic province (CAMP). Others have pointed out the coincidence of many continental flood basalt events with continental rifting. This is consistent with a system that tends toward equilibrium: as matter rises in a mantle plume, other material is drawn down into the mantle, causing rifting. In parallel with the mantle plume model, two alternative explanations for the observed phenomena have been considered: the plate hypothesis and the impact hypothesis. The plate hypothesis suggests that "anomalous" volcanism results from lithospheric extension that permits melt to rise passively from the asthenosphere beneath. It is thus the conceptual inverse of the plume hypothesis, attributing volcanism to shallow, near-surface processes associated with plate tectonics, rather than active processes arising at the core-mantle boundary. The plate hypothesis argues that deep mantle plumes causing surface, time-progressive volcanism do not exist[clarification needed (Is paper really a claim to exclusive universality? )][not in citation given]. Lithospheric extension is attributed to processes related to plate tectonics. These processes are well understood at mid-ocean ridges, where most of Earth's volcanism occurs. It is less commonly recognised that the plates themselves deform internally, and can permit volcanism in those regions where the deformation is extensional. Well-known examples are the Basin and Range Province in the western USA, the East African Rift valley, and the Rhine Graben. Under this hypothesis, variable volumes of magma are attributed to variations in chemical composition (large volumes of volcanism corresponding to more easily molten mantle material) rather than to temperature differences. Sublithospheric melt ponding and draining. In addition to these processes, impact events such as ones that created the Addams crater on Venus and the Sudbury Igneous Complex in Canada are known to have caused melting and volcanism. In the impact hypothesis, it is proposed that some regions of hotspot volcanism can be triggered by certain large-body oceanic impacts which are able to penetrate the thinner oceanic lithosphere, and flood basalt volcanism can be triggered by converging seismic energy focused at the antipodal point opposite major impact sites. Impact-induced volcanism has not been adequately studied and comprises a separate causal category of terrestrial volcanism with implications for the study of hotspots and plate tectonics. In 1997 it became possible using seismic tomography to image submerging tectonic slabs penetrating from the surface all the way to the core-mantle boundary. For the Hawaii hotspot, long-period seismic body wave diffraction tomography provided evidence that a mantle plume is responsible, as had been proposed as early as 1971. For the Yellowstone hotspot, seismological evidence began to converge from 2011 in support of the plume model, as concluded by James et al., "we favor a lower mantle plume as the origin for the Yellowstone hotspot." Data acquired through Earthscope, a program collecting high-resolution seismic data throughout the contiguous United States has accelerated acceptance of a plume underlying Yellowstone. Although there is strong evidence that at least two deep mantle plumes rise to the core-mantle boundary, confirmation that other hypotheses can be dismissed may require similar tomographic evidence for other hot spots. ^ Based upon Figure 17 in Matyska, Ctirad; Yuen, David A. (2007). "Lower-mantle material properties and convection models of multiscale plumes". In Foulger, G. R.; Jurdy, D. M. (eds.). Plates, plumes, and planetary processes. Geological Society of America. p. 159. CiteSeerX 10.1.1.487.8049. doi:10.1130/2007.2430(08). ISBN 978-0-8137-2430-0. ^ a b c d e f Foulger, G. R. (2010). Plates vs. Plumes: A Geological Controversy. Wiley-Blackwell. ISBN 978-1-4051-6148-0. ^ Wilson, J. Tuzo (8 June 1963). "Hypothesis of earth's behaviour". Nature. 198 (4884): 925–929. Bibcode:1963Natur.198..925T. doi:10.1038/198925a0. ^ a b Larson, R.L. (1991). "Latest pulse of Earth: Evidence for a mid-Cretaceous superplume". Geology. 19 (6): 547–550. Bibcode:1991Geo....19..547L. doi:10.1130/0091-7613(1991)019<0547:LPOEEF>2.3.CO;2. ^ Whitehead, Jr., John A.; Luther, Douglas S. (1975). "Dynamics of laboratory diapir and plume models". Journal of Geophysical Research. 80 (5): 705–717. Bibcode:1975JGR....80..705W. doi:10.1029/JB080i005p00705. ^ Tan, K. K.; Thorpe, R. B. (1999). "The onset of convection driven by buoyancy caused by various modes of transient heat conduction, Part I: Transient Rayleigh numbers". J. Chem. Eng. Sci. 54 (2): 225–238. doi:10.1016/S0009-2509(98)00248-6. ^ Tan, K.K. & Thorpe, R. B. (1999). "The onset of convection driven by buoyancy caused by various modes of transient heat conduction, Part II: the sizes of plumes". J. Chem. Eng. Sci. 54 (2): 239–244. doi:10.1016/S0009-2509(98)00249-8. ^ Tan, K. K.; Thorpe, R. B.; Zhao Z., Zhidan (2011). "On predicting the mantle mushroom plumes". Geoscience Frontiers. 2 (2): 223–235. doi:10.1016/j.gsf.2011.03.001. ^ Farnetani, C. G.; Richards, M. A. (1994). "Numerical investigations of the mantle plume initiation model for flood basalt events". J. Geophys. Res. 99 (B7): 13, 813–13, 833. Bibcode:1994JGR....9913813F. doi:10.1029/94jb00649. ^ Skilbeck, J. N.; Whitehead, J. A. (1978). "Formation of discrete islands in linear chains". Nature. 272 (5653): 499–501. Bibcode:1978Natur.272..499S. doi:10.1038/272499a0. ^ a b Sager, William W. "Insight into Motion of the Hawaiian Hotspot from Paleomagnetism". www.MantlePlume.org. Retrieved 2011-01-10. ^ Foulger, Gillian R. (2005). Plates, plumes, and paradigms; Volume 388 of Special papers. Geological Society of America. p. 195. ISBN 978-0-8137-2388-4. ^ Stein, M. & Hofmann, A.W. (1994). "Mantle plumes and episodic continental growth". Nature. 372 (6501): 63–68. Bibcode:1994Natur.372...63S. doi:10.1038/372063a0. ^ Storey, B.C. (1995). "The role of mantle plumes in continental breakup: Case histories from Gondwana". Nature. 377 (6547): 301–308. Bibcode:1995Natur.377..301S. doi:10.1038/377301a0. ^ Li, Shengtai; Li, Hui. "Parallel AMR Code for Compressible MHD or HD Equations". Los Alamos National Laboratory. Retrieved 2006-09-05. ^ a b Morgan, W. J. (1972). "Deep mantle convection plumes and plate motions". Bull. Am. Assoc. Pet. Geol. 56: 203–213. ^ Condie, Kent C. (1997). Plate tectonics and crustal evolution (4th ed.). Butterworth-Heinemann. p. 5. ISBN 978-0-7506-3386-4. ^ Brodholt, John P.; Helffrich, George; Trampert, Jeannot (2007). "Chemical versus thermal heterogeneity in the lower mantle: The most likely role of anelasticity". Earth and Planetary Science Letters. 262 (3–4): 429–437. Bibcode:2007E&PSL.262..429B. doi:10.1016/j.epsl.2007.07.054. ^ Trampert, J.; Deschamps, F.; Resovsky, J.; Yuen, D. (2004). "Probabilistic tomography maps chemical heterogeneities throughout the lower mantle". Science. 306 (5697): 853–856. Bibcode:2004Sci...306..853T. doi:10.1126/science.1101996. PMID 15514153. ^ a b Anderson, D. L. (1998). "A model to explain the various paradoxes associated with mantle noble gas geochemistry". Proc. Natl. Acad. Sci. 95 (16): 9087–9092. Bibcode:1998PNAS...95.9087A. doi:10.1073/pnas.95.16.9087. PMC 21296. PMID 9689038. ^ Kurz, Mark (1999). "Dynamics of the Galapagos hotspot from helium isotope geochemistry". Geochimica et Cosmochimica Acta. 63 (23–24): 4139–4156. Bibcode:1999GeCoA..63.4139K. doi:10.1016/S0016-7037(99)00314-2. Retrieved 2011-04-06. ^ Scherstén, Anders. "Re-Os, Pt-Os and Hf-W isotopes and tracing the core in mantle melts". www.MantlePlume.org. Retrieved 2011-01-18. ^ Ritsema, J.; van Heijst, H. J.; Woodhouse, J. H. (1999). "Complex shear wave velocity structure imaged beneath Africa and Iceland" (PDF). Science. 286 (5446): 1925–1928. doi:10.1126/science.286.5446.1925. PMID 10583949. Archived from the original (PDF) on 2011-05-22. ^ Montelli, R.; Nolet, G.; Dahlen, F.; Masters, G. (2006). "A catalogue of deep mantle plumes: new results from finite-frequency tomography". Geochemistry, Geophysics, Geosystems. 7 (11): n/a. Bibcode:2006GGG.....711007M. doi:10.1029/2006GC001248. ^ "Banana-doughnut tomography – can it reveal plumes (better than conventional ray theory)?". www.MantlePlumes.org. Retrieved 2011-01-19. ^ a b c d e Eric Hand (2015-09-04). "Mantle plumes seen rising from Earth's core". Science. 349 (6252): 1032–1033. doi:10.1126/science.349.6252.1032. PMID 26339001. ^ Scott W. French; Barbara Romanowicz (2015-09-03). "Broad plumes rooted at the base of the Earth's mantle beneath major hotspots". Nature. 525 (7567): 95–99. Bibcode:2015Natur.525...95F. doi:10.1038/nature14876. ^ Robert Sanders (2015-09-02). "CT scan of Earth links deep mantle plumes with volcanic hotspots". Berkeley News (UC Berkeley). ^ a b Courtillot, V.; Davaillie, A.; Besse, J.; Stock, J. (2003). "Three distinct types of hotspots in the Earth's mantle". Earth and Planetary Science Letters. 205 (3–4): 295–308. Bibcode:2003E&PSL.205..295C. CiteSeerX 10.1.1.693.6042. doi:10.1016/S0012-821X(02)01048-8. ^ Richards, M.A. ; Duncan, R.A.; Courtillot, V.E. (1989). "Flood basalts, and hotspot tracks: Plume heads and tails". Science. 246 (4926): 103–107. Bibcode:1989Sci...246..103R. doi:10.1126/science.246.4926.103. PMID 17837768. ^ Griffiths, R.W. ; Campbell, I.H. (1990). "Stirring and structure in mantle plumes". Earth and Planetary Science Letters. 99 (1–2): 66–78. Bibcode:1990E&PSL..99...66G. doi:10.1016/0012-821X(90)90071-5. ^ Duncan, R.A. & Pyle, D.G. (1988). "Rapid eruption of the Deccan flood basalts at the Cretaceous/Tertiary boundary". Nature. 333 (6176): 841–843. Bibcode:1988Natur.333..841D. doi:10.1038/333841a0. ^ Renne, P.R. ; Basu, A.R. (1991). "Rapid eruption of the Siberian Traps flood basalts at the Permo-Triassic boundary". Science. 253 (5016): 176–179. Bibcode:1991Sci...253..176R. doi:10.1126/science.253.5016.176. PMID 17779134. ^ Encarnacion, J.; Fleming, T.H. ; Elliot, D.H.; Eales, H.V. (1996). "Synchronous emplacement of Ferrar and Karoo dolerites and the early breakup of Gondwana". Geology. 24 (6): 535–538. Bibcode:1996Geo....24..535E. doi:10.1130/0091-7613(1996)024<0535:SEOFAK>2.3.CO;2. ^ El Hachimi, H.; et al. (2011). "Morphology, internal architecture and emplacement mechanisms of lava flows from the Central Atlantic Magmatic Province (CAMP) of Argana Basin (Morocco)". In van Hinsbergen, D. J. J. (ed.). The formation and evolution of Africa: a synopsis of 3.8 Ga of earth history. Geological Society, London, Special Publications. Special Publications volume 357. 357. London: Geological Society of London. pp. 167–193. Bibcode:2011GSLSP.357..167H. doi:10.1144/SP357.9. ISBN 978-1-86239-335-6. ^ a b Renne, P.R. ; Zhang, Z.C. ; Richards, M.A. ; Black, M.T. ; Basu, A.R. (1995). "Synchrony and causal relations between Permian-Triassic boundary crises and Siberian flood volcanism". Science. 269 (5229): 1413–1416. Bibcode:1995Sci...269.1413R. doi:10.1126/science.269.5229.1413. PMID 17731151. ^ a b James, David E.; Fouch, Matthew J.; Carlson, Richard W.; Roth, Jeffrey B. (May 2011). "Slab fragmentation, edge flow and the origin of the Yellowstone hotspot track". Earth and Planetary Science Letters. 311 (1–2): 124–135. Bibcode:2011E&PSL.311..124J. doi:10.1016/j.epsl.2011.09.007. ^ Kerr, Richard A. (31 January 1997). "Deep-Sinking Slabs Stir the Mantle". Science. AAAS. Retrieved 2013-06-13. ^ Ji, Ying; ataf, Henri-Claude N (June 1998). "Detection of mantle plumes in the lower mantle by diffraction tomography: Hawaii". Earth and Planetary Science Letters. 159 (3–4): 99–115. Bibcode:1998E&PSL.159...99J. doi:10.1016/S0012-821X(98)00060-0. ^ Schmandt, Brandon; Dueker, Kenneth; Humphreys, Eugene & Hansen, Steven (April 2012). 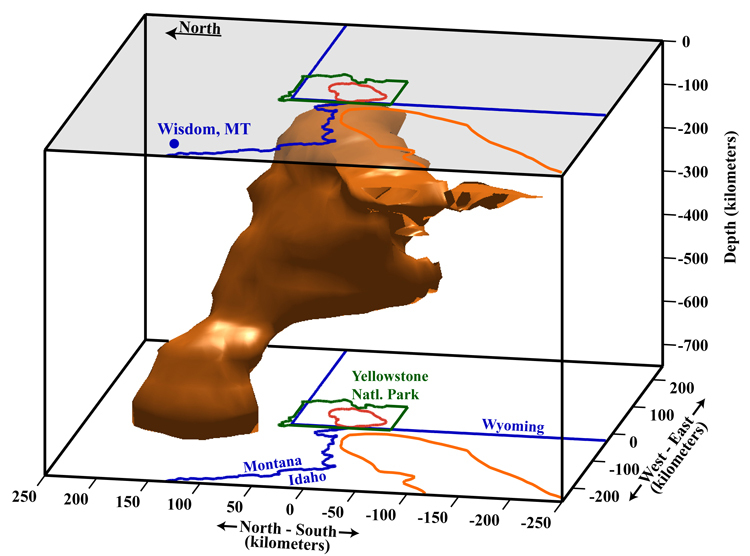 "Hot mantle upwelling across the 660 beneath Yellowstone". Earth and Planetary Science Letters. 331–332: 224–236. Bibcode:2012E&PSL.331..224S. doi:10.1016/j.epsl.2012.03.025. ^ Kerr, Richard A. (June 2013). "Geophysical Exploration Linking Deep Earth and Backyard Geology". Science. 340 (6138): 1283–1285. doi:10.1126/science.340.6138.1283. PMID 23766309. ^ Kerr, Richard A. (April 2013). "The Deep Earth Machine Is Coming Together". Science. 340 (6128): 22–24. doi:10.1126/science.340.6128.22. PMID 23559231.